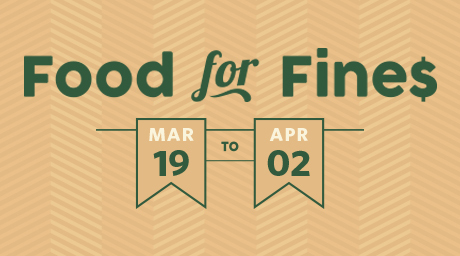 This year’s Spring UBC Library and Alma Mater Student Society (AMS) Food for Fines Campaign raised a total of $2,278.00 across the Vancouver and Okanagan campuses. Now in its sixteenth consecutive year at UBC, the Food for Fines campaign waives $2 in Library fines for every food item donated, to a maximum of $30. The program began as a joint initiative to support disadvantaged members of the community, and has become an integral source of the AMS Food Bank’s food reserves to support UBC students in need. Non-perishable food items were collected at circulation desks and then distributed to the AMS Food Bank. Thank you to everyone who participated in this year’s campaign! Please note that members of the community are welcome to donate goods year-round at the AMS Food Bank and Greater Vancouver Food Bank. 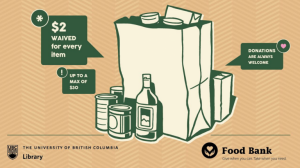 All donations go to the UBC AMS Food Bank on Campus and the Greater Vancouver Food Bank which provide food relief for students in need, including non-perishable foods, supplies and information about additional resources on- and off-campus. This year’s Spring UBC Library and Alma Mater Student Society Food for Fines Campaign raised a total of $2,235.00 over the Point Grey and Okanagan campuses. Now in its fifteenth consecutive year at UBC, the Food For Fines campaign waives $2 in Library fines for every food item donated, to a maximum of $30. The program began as a joint initiative to support disadvantaged members of the community, and has become an integral source of the AMS Food Bank’s food reserves to support UBC students in need. Please note members of the community are welcome to donate goods year-round at the AMS Food Bank and Greater Vancouver Food Bank. For more information visit the AMS Food Bank website. This year’s UBC Library and Alma Mater Student Society Food for Fines Campaign raised a total of $3,845.00.